If you have a missing tooth, you are likely wondering how a dentist can help. There are several different options available to replace your missing tooth. It is a mistake to leave the gap in your mouth. A gap between your teeth will also make the chewing process that much more challenging. Furthermore, adjacent teeth can slide right into the open space as time progresses, spurring issues with the gums and/or bite. It is better to replace the missing tooth with one of the options below. Dental implants are one of the more expensive options for replacing missing teeth yet they are worth the money and then some. This unique approach to replacing missing teeth relies on an implant that functions as an anchor within the jaw and a crown that serves as the visible portion of the fake tooth. The crown breaks food apart just like regular teeth. Once your dental implants are in your mouth, you will forget you are relying on artificial teeth to chew. Furthermore, dental implants look just like regular teeth so onlookers will have no idea your teeth are artificial. Dentures are artificial teeth that people can remove with ease. Partial dentures replace one or several teeth. Complete dentures replace all of the teeth missing in the jaw. The partial variety holds artificial teeth with a framework consisting of plastic or metal. This framework is removable and can fit comfortably around nearby teeth. Dentures cover a portion of the gum tissue or even the roof of the mouth. Rests and hooks sometimes help to keep the framework firmly in position. 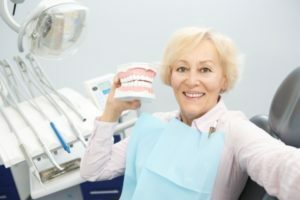 The downside to dentures is such support mechanisms are sometimes visible when laughing, talking, smiling, etc. In other cases, the dentures will come loose and fall out when someone speaks, laughs or eats. As long as you clean your dentures each night and give your gums a chance to breathe, this can be an effective tooth replacement option. Bridges rely on natural teeth next to empty spaces to support a fake tooth between them. This process requires a professional to contour and shave the natural teeth before positioning the crown. This type of dental crown is also known as an abutment tooth. The crowns on the teeth provide support for the false tooth in the middle, known as the pontic tooth. Bridges are the optimal solution in instances when adjacent teeth require crowns and when large fillings are susceptible to fracture. If the natural teeth are in good shape, reducing them in preparation for a bridge will only damage them to an unnecessary degree. Gum disease or decay can also cause people to lose the natural teeth which will also cause one to lose the full bridge. Many people prefer dental implants instead of this option. Dental implants only apply to positions where there are no teeth. There is no need to rely on other teeth for support. Composite bridges have emerged as an intriguing alternative to conventional fixed bridges. Composite resin can now be used as a bridge so two anchor teeth do not have to be ground to posts. The adjacent teeth are used as building points and composite materials fill the open gap. This approach does not require the use of metal. Furthermore, even if the anchor teeth sustain damage or decay, it is still possible to remove the bridge and retain at least one tooth. « How Can I Ease my Dental Anxiety?